Turning clocks backwards and forwards always leads me to believe that time is arbitrary — an agreed-upon method of segmenting the day for common reference despite whatever natural inclinations the body might have. While timekeeping has existed for millenia, standardization of time across the globe is a relatively modern practice. Up until the late eighteenth century, precise schedules were not kept. It wasn’t until the nineteenth century and the industrial revolution with its vast rail and communication networks that standardizing and synchronizing time across large regions became a necessity of doing business. The history and practice of daylight savings time is well-documented, and there is no need to cover it here. Read Seize the Daylight (http://www NULL.seizethedaylight NULL.com/) and the story of DST will be made clear. What’s more interesting is the concept of time itself. 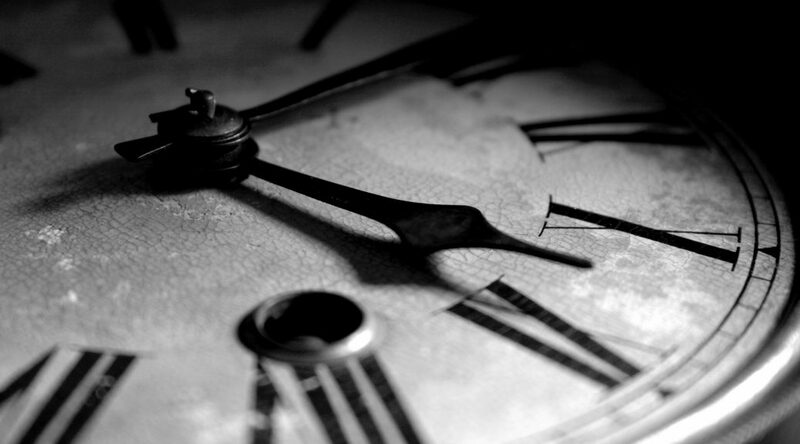 To the ancients, time was quite often literally and figuratively fluid. While sundials that relied on celestial bodies have been in use for millennia, water clocks — used by Egyptian, Greek, Roman, Persian, Chinese and other cultures — seem somehow more important as these devices could measure time at night. Anyone could look to the sky and know how much time there was between dawn and noon, noon and dusk simply by the position of the sun. But knowing the hours that would pass between the dusk and dawn? That took ingenuity. And water. Water clocks were usually simple stone vessels with slanted sides that allowed water to drip at a nearly constant rate from a hole in the bottom. 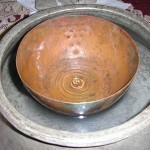 Others were bowl-shaped containers designed to slowly fill up with water coming in at a constant rate. 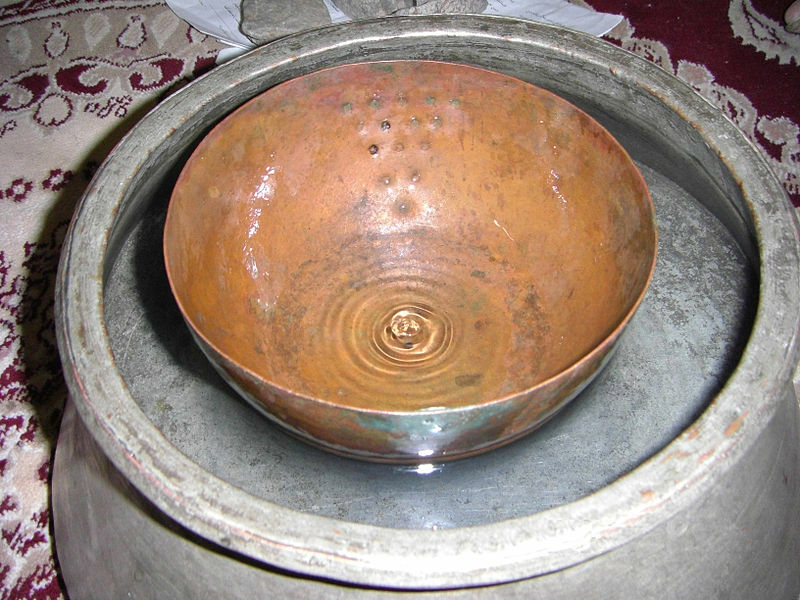 Another version consisted of a metal bowl with a small hole in in its base that when placed in a container of water would fill and sink in a consistent manner that could be measured — often used to time the portioning of water itself (as is the case with the bowl seen here). In the measuring of time with water, there may even be a deeper religious meaning known to the ancients: that of gods and goddesses associated with water also being somehow connected to time. The Egyptian god Thoth, for example — seen as a god of wisdom and the measurement and regulation of events and of time (http://books NULL.google NULL.com/books?id=ACkeJSSIvQYC&printsec=frontcover&source=gbs_ge_summary_r&cad=0#v=onepage&q&f=false) — is often depicted as having the head of an ibis: a water bird. Many gods associated with the passing of time, like the Chinese Shou Xing, carry water. Indeed, it would seem that associating water with time transcends religion and is in our very psyche; it would explain the fabled fountain of youth (http://science NULL.nationalgeographic NULL.com/science/archaeology/fountain-of-youth) — waters sought by explorer Juan Ponce de Leon and conqueror Alexander the Great. It would explain why a sip of water from the Holy Grail could grant immortality. Measuring time with water seems only natural then if water that is supernatural can be a restorative element against the ravages of time. And if in your part of the globe you participate in the ritual that is the return to standard time, keep in mind that although your clocks may be turned back, you can not turn back the tide of time.